Search.socialnewpagessearch.com is yet another browser to be released by Imali Media, a company dedicated to making the Internet unsafe one browser hijacker at a time. The question whether to remove this hijacker from your browser is non-debatable as it is set to replace your browser’s homepage and new tab page with its address. This is malicious in itself. However, this hijacker has several other problems, namely promotion of content of unverified legitimacy and information collection. To find out more about this infection we invite you to read this whole article as it contains the most relevant information available about it. Let us begin our analysis with this hijacker’s distribution methods. Truth be told, this hijacker is no different from the dozens of other hijackers that come from the company called Imali Media. This company is in the online advertising business, and this, and other hijackers are required to redirect web traffic and generate adverting revenue. We will elaborate on this a bit later. Now, as far as its distribution methods are concerned, we have found that its main distribution channel is a dedicated website called http://socialnewpages.com. This site is supposed to provide you with easy access to various social network platforms, but the reality is that it just features links to them, but this feature does not make it unique because you can make a custom bookmark to a site using the browser’s built-in features. This extension is named Social New Pages, and we firmly believe that the only reason it even exists is to carry Search.socialnewpagessearch.com and set it as your web browser’s homepage or new tab page address. This setup is nothing new and most of Imali Media’s current hijackers come with browser extensions that you can get from their dedicated websites. 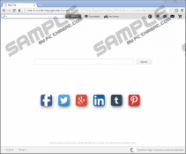 However, the deception here is that when you install this extension, it does not allow you to deselect Search.socialnewpagessearch.com, so it forces it onto your browser without your approval. We found that this hijacker is getting more and more visits and the reason for this is that its developers have made arrangements to promote the extension via pop-ups ads that may be shown by adware type software such as Vertech, Search Expanse, KorAd, and so on. So if you see annoying pop-ups, then you probably have an adware-type application installed, and you should get rid of it before it compromises your computer’s security completely. Now that we know how Search.socialnewpagessearch.com is being disseminated let us elaborate on how it works. It looks like a clean and legitimate search engine, and it features bookmarks to social media network pages that include Facebook, Twitter, Google+, Linkedin, Tumblr, and Pinterest. At also features links to news and sports-related sites which are legitimate, but they are more of a distraction from its real function which is to show third-party links in its search results. However, it is important to note that it redirects the entered search queries to ca custom Yahoo search engine that is configured to show additional third-party links supplied by Imali Media. The promoted content is separated from the rest of the search results and the links are labeled “Promotional Results For You.” We are concerned that these advertisements may come from dishonest advertisers that promote malicious content such as websites that host malware downloads. Hence, your PC may become infected with spyware, adware, and other malware is if you download seemingly legitimate software from the promoted links. As you can see, Search.socialnewpagessearch.com is a potential security threat that can get your PC infected with malware, but it cannot do that automatically as it needs you in the loop. Its deceptive promotions aim to trick you into thinking that some program is useful and convince you to download it. Mind you, this scenario may not play out as most of the links are safe. Nevertheless, given the shady nature of its developer we are positive that it will promote illicit content at some point, so we recommend that you remove Search.socialnewpagessearch.com and its extension Social New Pages. Then, launch the web browser. Simultaneously press Alt+T and select Options. Enter a new homepage address in the General tab. Enter the following file paths in the File Explorer. Simultaneously press Alt+F and select Options. Find the On startup section and set a new page address. Go to the Search section and select a new search provider. Quick & tested solution for Search.socialnewpagessearch.com removal.